As historic votes were cast in Albany, why was Robin Schimminger in Kenmore? ALBANY – It’s been a busy time during the first few weeks of the legislative session in Albany. There have been votes – following hours of floor debates -- on major topics including election laws, anti-discrimination and immigration policies, teacher evaluations and new protections and access to abortions. Add to that Gov. Andrew M. Cuomo’s annual State of the State address to lawmakers and his accompanying 2019 budget plan, and it’s been a non-stop period of action at the Capitol. 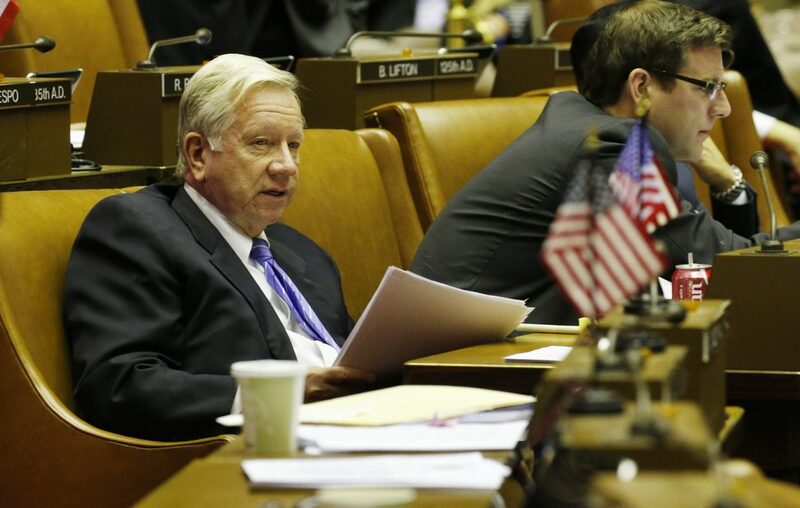 But not for Western New York’s longest-serving state lawmaker: Assemblyman Robin Schimminger. The Kenmore Democrat, for several reasons, has missed all three weeks – totaling five session days – since the 2019 session started on Jan. 9. “I’m not on a beach," he said. In fact, Schimminger said, he’s been at work in his district since the session start. But why not be at the Capitol with his fellow lawmakers making, well, laws? Or debating bills both behind closed doors with fellow Democrats or on the Assembly floor? Or meeting with the hodge-podge assortment of groups that descend on legislators' Albany offices once the session starts? Let’s go week by week. The first day of session – which took place this year on Jan. 9 – is largely ceremonial. It’s a bit like the first day of school, with legislative leaders giving speeches and the like. There were no votes on legislation, though the Assembly did take a vote to re-elect Carl Heastie, a Bronx Democrat, for another two-year term as Speaker. “The Speaker knew I supported him … and that’s considered an important day for new members," Schimminger said. Schimminger is not a new member. He was first elected to the Assembly in 1976. On week two – a two-day session that began Jan. 14 – the Legislature hit the ground running, passing on that first day an important series of changes to New York's election laws, including authorizing early voting and the first of two required legislative votes on a constitutional amendment to allow people to register to vote as late as on Election Day. “Historically, the first week after the opening day, nothing happens. Committees have not yet cranked up and it is simply a day when the two floor leaders give speeches and new members are introduced. This year was different … It was a unique first week which I was not accounting for,’’ Schimminger said. On Jan. 15, after holding session in the two houses, lawmakers gathered in a state theater near the Capitol to hear Cuomo give his annual speech and to release his state budget plan. “I followed from afar in the district," said Schimminger, who noted that he has been working every day back in his district, holding meetings, doing a TV interview and other such things. This past week, lawmakers returned to Albany for another two-day work week that began on Tuesday, a day after the Martin Luther King holiday. Schimminger was all set to make it for this past week's session days. As he often does, he had a flight from Buffalo to Albany via a transfer at Dulles International Airport outside Washington, D.C.
His plane was set to take off at 10:30 that Tuesday morning and arrive in Albany at 2:08 in the afternoon. But the jetway's wheels were frozen in place, preventing the plane – a 50-seat regional jet – from being able to move. FlightAware, a flight tracking, shows the plane taking off from Buffalo that morning 63 minutes late. But Schimminger, and some other passengers, got off before it departed when he said it became clear he would not make his connection in Dulles. So, why not simply drive to Albany after getting off the plane? By the time he got to Albany, he said, it would have been 5 in the evening. The Assembly that night debated an abortion rights bill until about 6:30 p.m. The next day, it was another busy day in the Assembly, with bills passing pertaining to teacher evaluations and giving undocumented immigrants access to state financial aid to help pay for college; that bill passed shortly after 6 p.m. Before heading home, Assembly Democrats then went into a private meeting that night to discuss a variety of topics, including bills that will be considered in the coming week, such as the Child Victims Act and a gun control package. In all, Schimminger missed votes on 17 bills and two constitutional amendment resolutions. “In my original planning (for the session start) I anticipated that it was important to spend as much time with my family," he said. And then there were the merits of the bills that were taken up so far. Schimminger, a conservative Democrat, noted that much of what was passed in his absence was what he called “a veritable Niagara of progressive legislation." He said he would have voted no on nearly all the bills anyway had he been in Albany, except maybe a couple of the election law changes. Instead, next to his name on the tally sheets: “ER,’’ which means excused for a reason. “I think that given the fact that I was historically largely in the negative on the preponderance of these bills and 'ER' has the same effect as a no vote, there was not a sense of urgency,’’ Schimminger said about missing the early session days at the Capitol. Will he be at the Capitol on Monday?